So, about tree fiddy years ago — after having let myself go for a few years of uni — I was motivated to get fit. I competed in some friendly bets with a few friends: a weight loss bet and then a six pack bet. If you’re interested in the progress, see this blog post (as well as older posts). In ~5 weeks, I’ve lost ~1 stone and 4 inches from my waist! 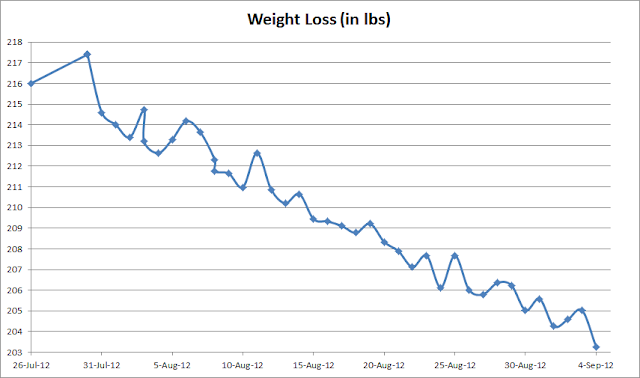 That said, I’ve still got a long way to go (my lowest weight in the prev 6-pack bet was ~176 lbs). I think my current goal is to get to 185 lbs and anything under that would be great! I’m quite fond of using technology (gadgets and software) to help out with a weight loss plan. The gadgets are nice for improving efficiency as I despise the tedious, monotonous, and error-prone methods of recording data by hand and having to remember to input values into a spreadsheet (that ends up getting lost at some point). The software, on the other hand, is really nice for recording and displaying all of this data and providing really neat graphs and stats! Okay, I admit it… I’m a data geek. What’s best though, is when the gadgets and software work together and PROMOTE SYNERGY! Almost any good tracking software has really handy iOS and Android apps that upload your data directly to their corresponding sites. Also, there seems to be a nice trend emerging with a bunch of these sites to all connect with each other. For instance, when I weigh myself, my scale uploads the weight and body fat measurements to my online Withings account (the maker of the scale), since I’ve connected Withings with Runkeeper and Cronometer, my weight is also instantly sent to those tracking sites. Similarly, when I finish a run, the Runkeeper app on my phone immediately uploads the speed, distance, time, heart rate, and GPS coordinates directly to my Runkeeper account and since I’ve connected Runkeeper with Fitocracy, that’s also immediately updated! Isn’t technology amazing! * Withings — I’m using their wireless body scale and blood pressure monitor to record weight, body fat, lean muscle mass, BMI, pulse, systolic, and diastolic blood pressure. It’s all uploaded to their site instantly. * Cronometer — A really cool nutrition/food/calorie tracking site my friend created (he’s also the guy who pretty much single-handedly coded the back-end of Rush Poker). You can use Android, iOS, or the web app to track your data. Check it out! * Zeo — a sleep-tracking site. Using their [admittedly quite funny looking] gadget, it’ll send your iPhone data all night for things like: time to get to sleep, total sleep time, deep sleep time, REM sleep time, number of times woken up, amount of time awake. * Fitocracy — “is an online game and social network that aims to use gamification to help users improve their fitness” (from its Wiki entry). It’s pretty neat, there’s points, level-ups, achievements, quests, and other neat things to keep it fun. * Runkeeper — I really like this one! It can automatically grab data from your Withings and Zeo accounts and automatically send workouts to your Fitocracy account. It also has a pretty nice mobile app — which, by the way, can be linked up with several heart rate monitors — and as soon as you finish your exercise, all of your precious data is seemlessly uploaded to your account. Technology stuff aside, I’ve been going to see a personal trainer and just finished my 6th session with Rob Smyth yesterday. I first heard about Rob through the epic weight loss bet between Andrew Grimason and Marc MacDonnell. It turns out he also trains a bunch of other Irish poker pros like Eoghan O’Dea, John O’Shea, Dermot Blain, and others. I’m really happy with our sessions so far, they are by far the highest intensity sessions I’ve ever had and he certainly pushes me much harder than I could push myself. As you can probably imagine, when your line of work involves flexible hours of your choosing, it can become quite easy to develop lazy and unproductive habits. Being a natural procrastinator, I found it hard to manage things I had to do (e.g. run errands or write a blog post…) and the seemingly ever-growing list of TODOs wasn’t going to get any shorter on its own… So, I decided to find some tools to help me out with my discipline. I somehow stumbled upon the book Getting Things Done by David Allen (which you can also get in audiobook format). This seems to be the go-to book for this stuff and for good reason. I haven’t finished it yet but even reading the first few chapters should give you some motivation and some ideas for how to go about increasing your productivity. I was also searching for some really good task management software. I got several good suggestions from friends on twitter and facebook and spent about two full days researching and testing lots of the top-rated sites. While at first it seemed that I had quite a simple problem which should have a simple solution, as I delved deeper into the problem (wanting to manage tasks in a specific way), I realized just how strict my requirements really were. There are LOTS of task management websites and while most of them do a lot of things right, I think a lot of them are incomplete or could use some user interface enhancements. * Has a mobile app. Pretty much a necessity for all those occasions where you’re out and remember you have to do something. * Has a really nice, simple yet powerful, and intuitive web interface. While this should probably be priority #1 imo, most sites are far from this. Many are over-complicated and stuffed with too many features or slow and inefficient requiring way too many page loads. * Collaboration. For anything that requires you to work with someone else. Imagine working on a school project with some friends or sharing a vacation or grocery list with a spouse. The ability to assign a task to a collaborator is a must. In the end, I ended up choosing Asana and am still very pleased with that decision. Let me know if you’ve used others that you really like. Oh yeah, aside from that, after years of dreaming of what it would be like, I finally achieved Inbox Zero: keeping my email inbox empty and having no unread mail! It really does feel like a huge load has been lifted off me (that’s what she said) and there’s more time for other things. Reading David Allen’s GTD, you’ll realize just how much time and energy is spent worrying and thinking about your tasks instead of planning and doing them! I just realized you posted a new blog. You need to send a word out to everyone when you do cause it’s so infrequent. Love it!!! !